And the damn fool said push on"
Criticism gives you two main choices: either you can learn from it, or ignore it and keep on with what you are doing. Sadly, with the introduction of Smart Scopes on to the dash, Ubuntu 13.10 is mostly opting to ignore criticism, pushing ahead with changes that few seem to want and violating Unity's original design principles in favor of contradictory new ones. The criticism began just over a year ago, when Ubuntu announced that it would be adding Amazon search results to the dash. Since these results would be enabled by default, the move immediately raised concerns about privacy. Ubuntu tried to answer these concerns by adding a legal notice and the ability to turn off the Amazon notices, and even to uninstall the new feature. However, these changes were not enough to prevent Richard Stallman, the founder of the Free Software Foundation, from condemning Ubuntu as "spyware" or to quiet unrest among contributors. These concerns are potentially multiplied many times over in the 13.10 release by the introduction of Smart Scopes, a combination of search filters and bookmarks. Ubuntu recently promised that results would be sent anonymously to third parties -- but gave so few details about how the anonymization would be done that, essentially, it was asking users to trust Ubuntu and its corporate arm Canonical to do the right thing. At the same time, to judge from the betas, the legal notice and configuration setting to turn off results appear to have been dropped as no longer necessary. This is not the first time that Ubuntu and Canonical have pushed ahead with a feature that met with a lukewarm reception. The history of the Unity interface is crowded with them, from the repositioning of title bar buttons to the Head Up Display replacement for menus. However, while other unilateral changes had at least a semblance of design rationale, the reasons for Smart Scopes are much vaguer. Many of the additional results in the dash are irrelevant to the task in hand. Nor are users showing any sign of being impatient with using a browser for online searches, the way they have for the last twenty years. The problem is that Ubuntu is trying to use the dash for two separate purposes that are not especially compatible. While searches are the common factor, it is one thing to search the relatively small set of local resources and another to search the Internet, or even a large commercial site. Privacy issues and potential connection problems are online concerns that do not exist to the same degree locally. Anyway, the attempt to combine local and online searches has been done before -- and with indifferent results. 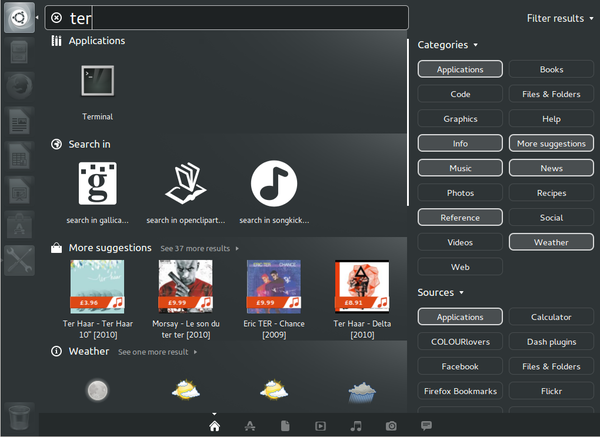 If Ubuntu paid more attention to KDE, it might have noted that the attempt to use Konqueror as both a file manager and a web browser was abandoned in the fourth release series, with a new file manager being added instead. A few holdouts still use Konqueror for both purposes, but most users apparently see no natural connection between local and online searches. If nothing else, the trouble is that search filters in the dash cannot possibly complete with a web browser. A web browser is a specialized tool, with plenty of room for features that the dash has no space before. Once you get past the name, you realize that Smart Scopes are no more than a series of bookmarks arranged in no particular effort, and that the results are crammed by default into a much smaller window than they would be in the browser. Nor do Smart Scopes offer the possibility of self-selected anonymous browsing, tabs, or any of the other features that even a simple modern browser offers today. Moreover, Smart Scopes is an obvious violation of the design principles that Unity is based upon. Say what you will about Unity and its functionality (and I, for one, am not a fan), aesthetically it is a model of minimalist design. Its panel is open only to a few app indicators, and its indicators for open and active apps are stragetically-placed arrows, compared to the task bars used by other desktop environments. However, contrast this design to the dash with Smart Scopes. While the rest of the desktop is uncluttered to a fault, the drop-down list of smart scopes is loosely organized and full of results that are, at best, peripheral to many searches. Even the way that active scopes are highlighted seems klunky compared to the rest of Unity. For instance, the launcher makes economic user of vertical space. Its position and its width are ideal for the dimensions of modern wide-screen monitors. It occupies no more than one-twelfth of the screen. By contrast, Smart Scopes are listed in two columns, that together occupy almost one-third of the dash. Either users endure, search results that are crammed into even less space than they have originally, or else they are continually click the list of scopes open and shut. Similarly, compare the display of Smart Scopes to the organization of the Systems Setting window. While the list of Smart Scopes is text-based with sometimes cryptic entries, System Settings offer aesthetically-pleasing icons, many of which give some clue to their functions. Minimal scrolling is needed to see the complete system settings, while the list of Smart Scopes constantly requires opening and closing of drop-down lists. Move from the dash with Smart Scopes to almost any other part of Unity, and you might wonder if you are still in the same desktop environment. In every way, Smart Scopes ignores the design expectations created by the rest of Unity, being clumsy, inefficient, and just plain ugly. Smart Scopes have one obvious advantage -- potentially, they might defray the cost of developing Unity through affiliate programs. Not all scopes, or even most of them offer this possibility, but obviously the possibility is there. Presumably, that is the main reason that Ubuntu has blundered ahead with their development despite the lack of encouragement from users. However, even if Smart Scopes eventually help Unity pay for itself, their success would come at too high a price. As the substitute for the menu and file manager of other desktop environments, the dash is an essential feature of Unity. To make it less effective can only make Unity less of a desktop alternative. Even worse, to make it less effective through adware (which is what the changes amount to, unless you insist on being punctiliously literal-minded), is to impose part of what people escaped by choosing to use free software in the first place. The idea that smart scopes could make Ubuntu profitable does not seem likely. Yet, even if it were, the profitability would be at the expense of narrowing the difference between free and proprietary software in the first place -- and that is a much higher price than I suspect most Unity users are willing to pay, no matter how great their loyalty to Ubuntu.